When a Deer Loses a Tooth, Does it Grow Back? Allegedly, no human being has ever seen a living dinosaur. Evolutionists insist that dinosaurs became extinct about 65 million years ago, while humans evolved about 62 million years later. But is this long time frame really what the evidence shows? Were living dinosaurs and humans separated by tens of millions of years? Consider three lines of evidence that prove humans and dinosaurs once lived together—not millions of years ago, but thousands of years ago. The Bible says that God made all of the land animals on the sixth day of Creation, followed by the creation of the first man, Adam (Genesis 1:24-28). Adam lived on the Earth with such amazing animals as lions, rhinoceroses, and elephants. 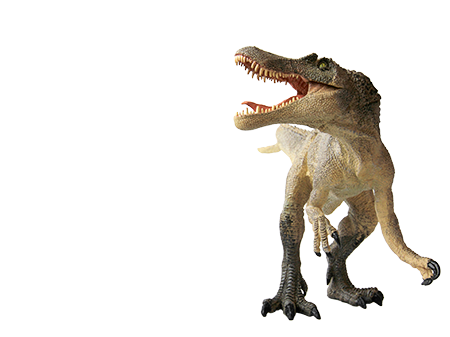 He also lived with dinosaurs of all shapes and sizes, because dinosaurs, by definition, are land-dwelling animals. And, since God made all land animals on day six of Creation, then Adam must have lived with dinosaurs, too. What’s more, Moses wrote in Exodus 20:11, “In six days the Lord made the heavens and the earth, the sea, and all that is in them” (including all the various kinds of animals). To the Christian who believes (based upon the evidence) that the Bible is the Word of God, the question of whether dinosaurs and humans once lived together is settled—the Bible says they did, along with all other animals that have ever inhabited Earth. If dinosaurs and humans once lived at the same time, it is logical to conclude that, just as humans tell stories today of impressive things they see, ancient people would also have told stories about dinosaurs. Do such stories exist? Have some dragon legends been exaggerated over time? Of course. Just as people today tend to embellish the size of fish they catch, people in the past said some things about dragons that were not true. But, such inaccuracies do not mean dragons never lived. Any honest person who reads the various dragon legends must admit that reptiles with long necks, scaly skin, horned heads, stout legs, and lengthy tails sound like dinosaurs. Dragon legends about flying snake-like reptiles with two legs, large wingspans, slender tails, and toothed beaks sound much more like the dinosaur-like, flying reptiles of the past than any animal alive today. Even the stories of massive, powerful sea reptiles, at least one of which breathed fire (read Job 41:18-21), sound very much like some of the dinosaur-like, marine reptiles of the past. 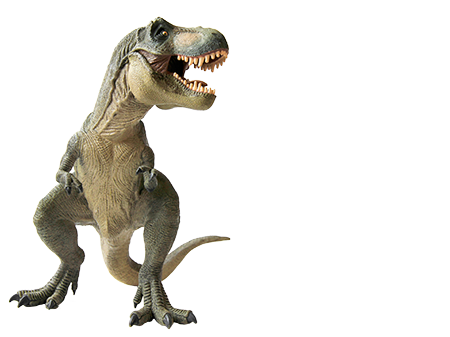 The fact is history backs up what the Bible says—humans and dinosaurs once lived together. Similar to how we take pictures of places we visit and wildlife we see in modern times, those living hundreds or thousands of years ago actually drew and carved pictures of dinosaurs. Such representations of dinosaurs are exactly what we would expect if humans ever saw these animals. 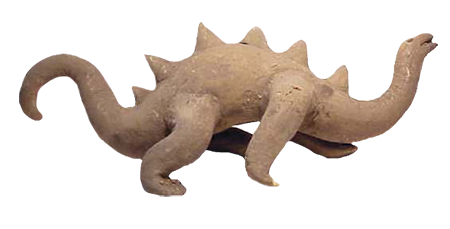 Although rarely discussed in the mainstream media, ancient dinosaur artwork has been found all over the world. 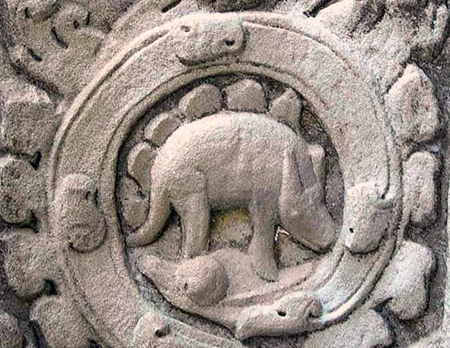 An approximate 900-year-old carving of a Stegosaurus was found on the continent of Asia (in the country of Cambodia). Centuries before learning about dinosaurs from the fossil record, a variety of these creatures were pictured in various castles in Europe. 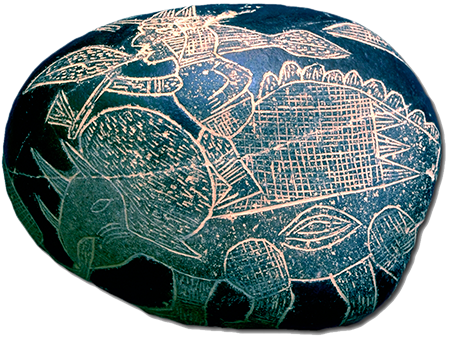 In South America, hundreds of ancient burial stones have been found with dinosaurs carved on them. 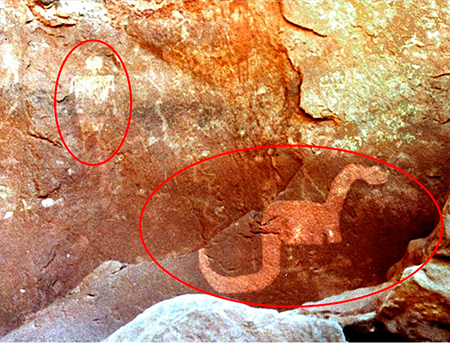 And in North America, various rock drawings and carvings have been found that clearly depict different dinosaurs. To continue believing in evolution, a person must reject the clear evidence which shows that dinosaurs and humans once cohabited Earth. The historical and physical evidence, along with the Bible, clearly testify that man and dinosaurs lived together and that evolution’s timeline is hopelessly flawed.